Great Britain is full of beautiful cities but very few of them are as stunning as Bath. This city is bursting with history dating back to Roman times, its buildings are examples of some of the UK’s finest Georgian architecture and its streets are some of the grandest in the world. Bath’s written history starts with the arrival of the Romans nearly 2000 years ago but stone tools, possibly dating from around 5,500 BC have been found in and around the city making it difficult to determine the city’s true beginning. The majority of Baths existence has centred around its thermal waters and its Abbey. And they are the two main reasons why you should visit this city. But don’t forget while you’re there to delve deeper and explore its lovely cobblestone streets surrounded by dazzling architecture. 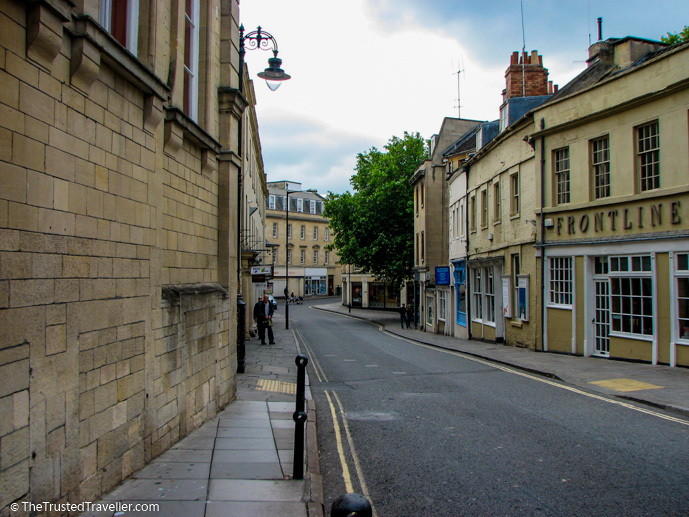 It can sometimes feel a little over crowded with the hoards of day trippers, but stay the night and explore early in the morning and through the evening to discover its beauty and all the things to do in Bath. 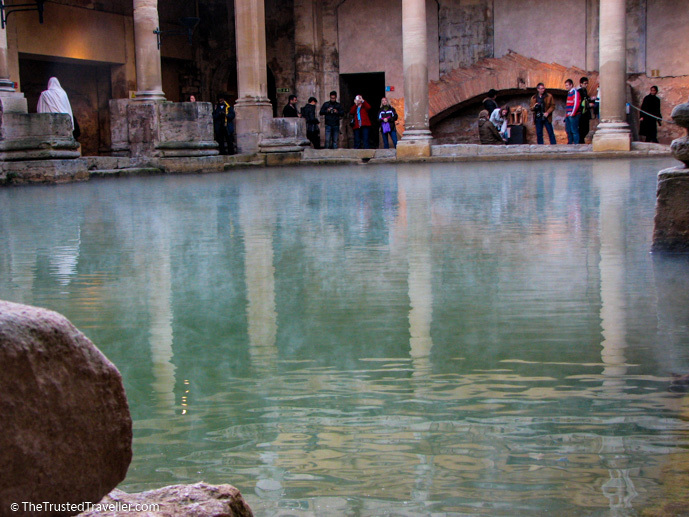 The Roman Baths complex is one of the most well-preserved and impressive in all of Europe. First discovered in the nineteenth century, the Romans Baths were initially built as part of the town of Aqua Sulis, which was founded in 44 AD. The baths were vast and lavish. Able to accommodate more people than just the residents of the town, they were intended as a place for people to visit from across the Roman Empire. In their day they were seen as a place to socialise and were the focal point of the town. Today visiting the Roman Baths offers an incredible insight into the lives of the ancient Romans. As you explore the Baths you will see and get up close to the baths themselves; elegant statues overlooking the Great Bath; the original 46ºc hot water which is known to have healing powers; and the Temple, one of the most sacred sights in the complex. 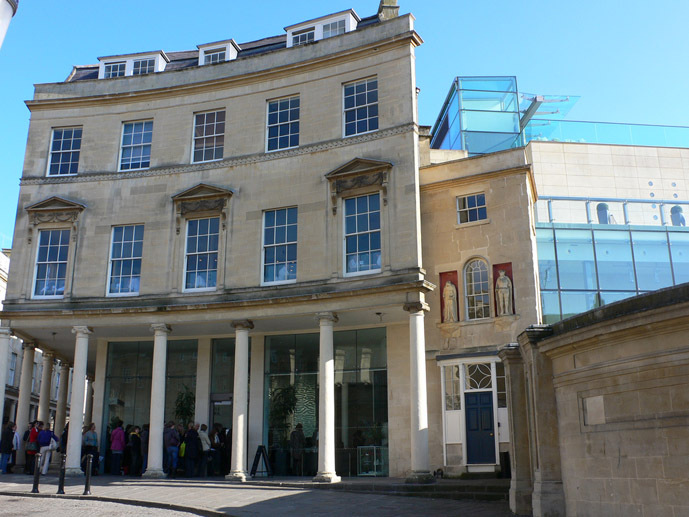 You can also visit the comprehensive museum dedicated to exploring the lives of the ancient Roman citizens of Bath and an ancient drain used as an overflow system. All of this can be done with the free audio tour that is included on entry. The most prestigious address in Bath is without a doubt The Royal Crescent. This curved row of 30 Georgian townhouses set against a large green lawn is a photographers dream and visited by hundreds of thousands of interested tourists each year. Built between 1767 and 1774, it is one of the greatest examples of Georgian architecture in the UK and is a Grade I listed building. The façade that you see today is completely untouched but the interiors have been redeveloped over the years by the various owners. 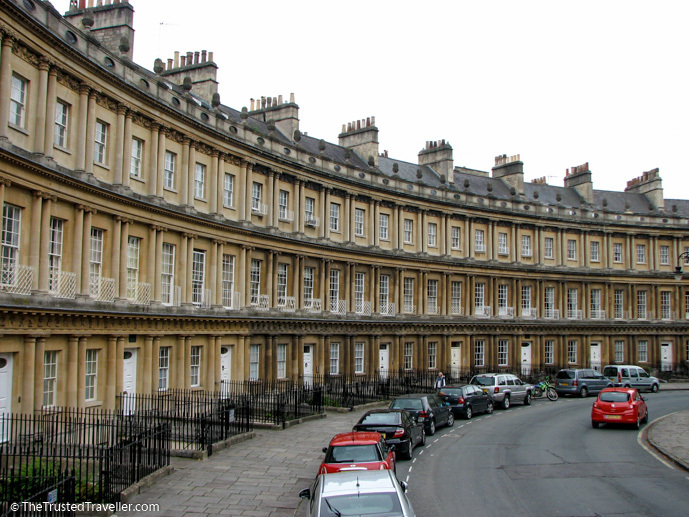 The majority of the townhouses these days are private homes and offices with a few in the centre belonging to the five-star, The Royal Crescent Hotel . To get a glimpse at the interiors without paying a small fortune to stay at the hotel, you can visit No.1 The Royal Crescent. This townhouse is now a museum and has been fully restored to how it would have looked in the 18th century. For an added touch of authenticity, the staff are all dressed in period costumes. 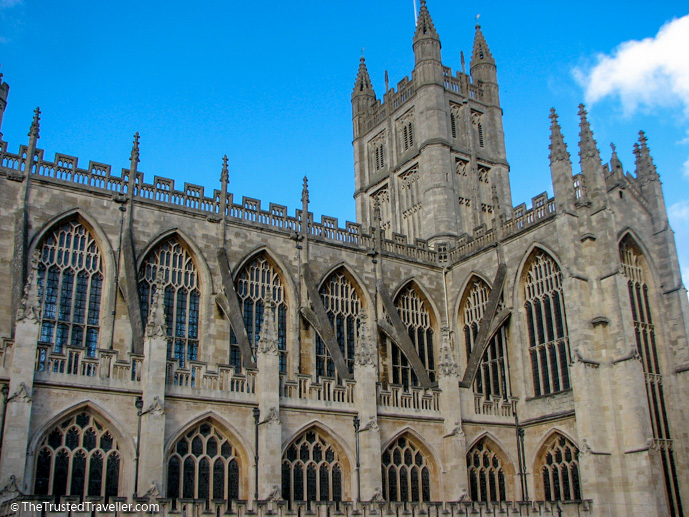 Located next to the Roman Baths, too many visitors walk past the beautiful Bath Abbey without a look inside. Bath Abbey was first built-in the 10th century and then rebuilt in the 12th and 16th centuries with major restoration works carried out in the 1860s. The church is an active place of worship, with hundreds of congregation members and hundreds of thousands of visitors each year. It is used for religious services, secular civic ceremonies, concerts and lectures with the church choir performing regularly. What I love most about the Abbey is the stained glass windows and the high vaulted ceiling. The windows, along with various other wall and floor plaques, are there to commemorate several notable people from the local population who served in war. Inside the vaults of the Abbey is also a nice small heritage museum worth a look at. Cost: Free, although visitors outside of service times are asked to make a small donation. 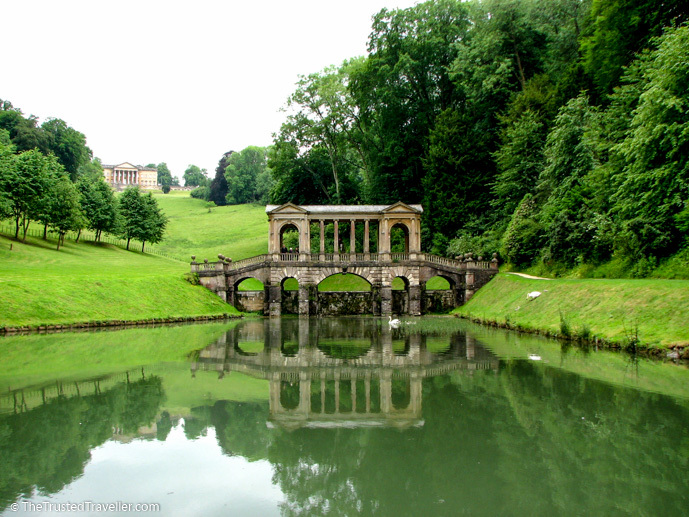 Owned by the National Trust, Prior Park is a lovely green space on the edge of town that is best known for its Palladian Bridge, of which there are only four left in the world. Designed by poet Alexander Pope with help from landscape gardener Capability Brown, this 28 acre landscaped garden is set on a dramatic site running down a small steep valley. From the top of the park and valley are spectacular views across the city. Along with the above mentioned Palladian Bridge, there is plenty to see on a walk through these lovely grounds including a Gothic temple, Mrs. Allen’s Grotto and four lakes. You might also run into some local wildlife in the form of white rabbits and squirrels darting across the paths and up the trees. Address: Ralph Allen Drive, Bath | Local buses stop less than a minute walk from the entrance or if you have a car the drive is only a few minutes from town. Hours: Opening times vary from day-to-day. Check the website below for exact times. The park closes at the earlier of dusk or 17:30 daily. In past posts I have talked about free walking tours a few times. All of those tours work based on tips given to the guides at the end of the tour. This one however is a little different in that the guides don’t accept tips, they lead these walking tours out of the goodness of their hearts and the satisfaction that visitors get to know their city a little better. The official title of these walks is The Mayor of Bath’s Corps of Honorary Guides and have run on and off for about 80 years. You meet the guides, usually 4 or 5, outside the Roman Baths and then are split into smaller groups and are then taken on a tour to visit all the main sights in the centre of Bath. Each guide has their own stories and tales while also informing you of important pieces of history and facts about Bath, its buildings and its residents. This is a great way to see the city if you have minimal time or as an introduction at the beginning of a few days stay. I am 100% certain you won’t be disappointed because really how can you be when something is free! Address: Meet outside the Roman Baths in the Bath Abbey Churchyard. Cost: 100% free and guides do not accept tips. The Jane Austen Centre is a museum and place for true Austen fans. 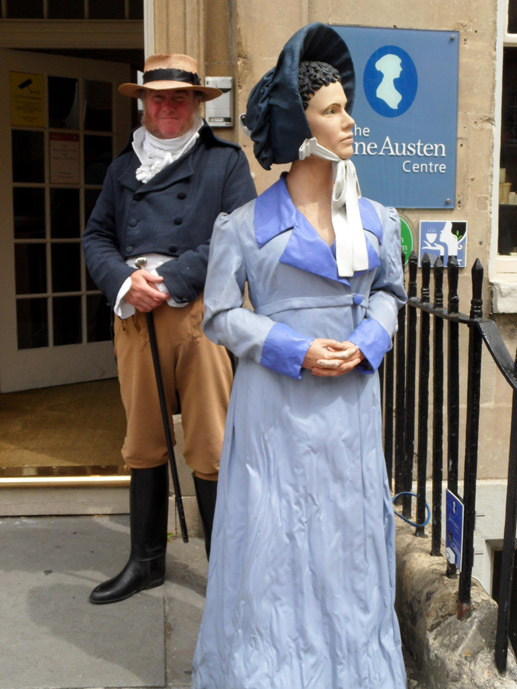 Not only did Austen live in Bath, the city was also the setting for two of Austen’s novels, Northanger Abbey and Persuasion, so it is fitting to have a museum honoring her here. The main theme of the museum gives visitors a look at what life would have been like in Regency times as well as showing how Bath had an impact on the novels she wrote. Onsite you can also enjoy the tea rooms. 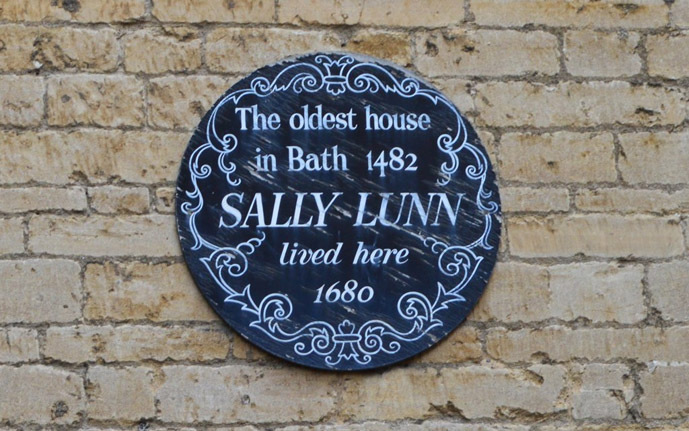 Sally Lunn was a French refugee who fled religious persecution and took refuge in Bath. The house where she lived and baked that first, now world-famous, bun dates back to 1482 and is now Sally Lunn’s Tea House and Museum. During your visit you can enjoy one of the calorific Sally Lunn Buns with cream and jam in the tea house and tour the museum kitchen which is the real original kitchen when she made that first bun. Cost: Adults 30p to view the museum kitchen | Check the website below for menu prices. 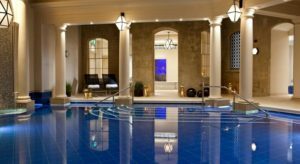 For your chance to take a soak in some of Bath’s famous natural thermal waters head to Thermae Bath Spa. Onsite you can enjoy the warm, natural mineral rich water in a few different spa settings including indoor and an outdoor roof top spa. While you’re there you can also indulge in other spa treatments like massages and facials. It’s the perfect way to wind down and relax after a day of sightseeing. Hours: Baths open from 09:00-21:30 daily with shorter hours for treatments which require prior reservation. Located less than 15 minutes’ walk from the Royal Crescent. 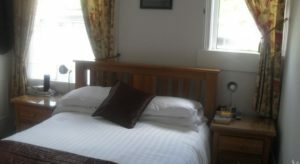 Rooms feature flat-screen TV, free Wi-Fi, and tea and coffee making facilities. A home cooked English breakfast is served each morning. 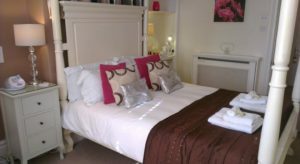 This B&B is located a few minutes’ walk from all of Bath’s top attractions. 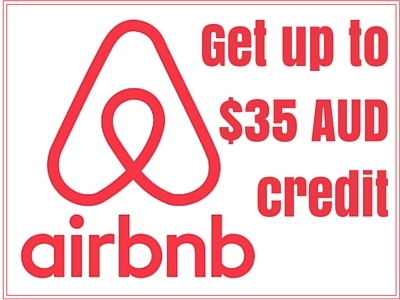 The property offers free on-site parking, air-conditioned rooms with free Wi-Fi, a mini-fridge, and iPod dock. Breakfast is served in your room. This five-star hotel, located just 100 m from the Roman Bath, has their own naturally heated thermal spa. Each room comes with a coffee machine and luxury bathroom. Some rooms feature a seating area also. 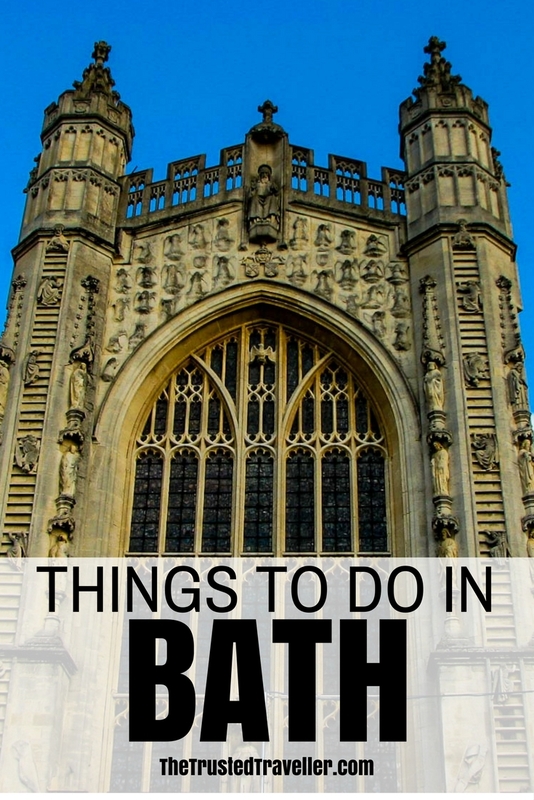 What’s top of your list of things to do in Bath? Or have you been already, what did you love about it? 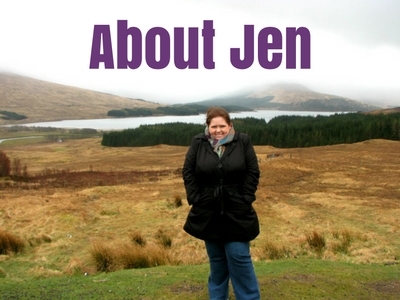 Jen, thanks for sharing some great options to explore in Bath. It looks like an amazing place to visit! Definitely another place to plan to visit when i next go to England. 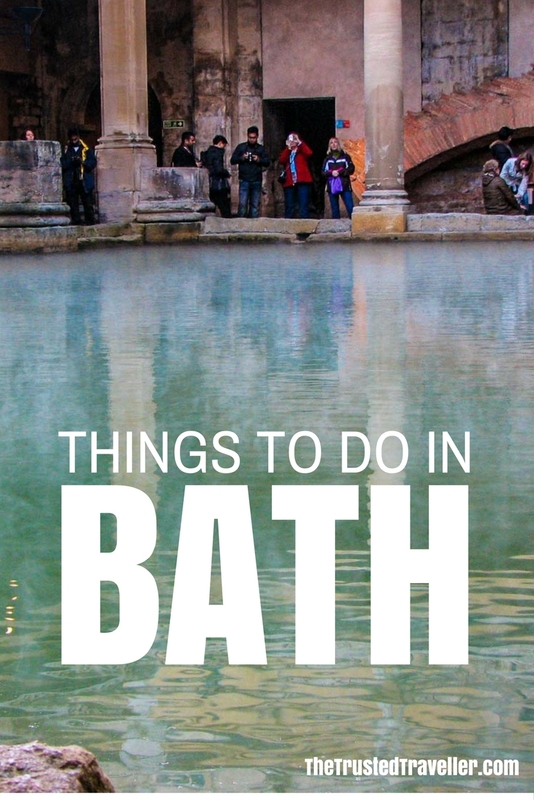 Outside of London, Bath is the one place you shouldn’t miss in England. It’s such a beautiful and easy place to visit. Hope you get over there soon Anne. Ok, you have just made my day – i have literally just bookmarked for when i move to London. 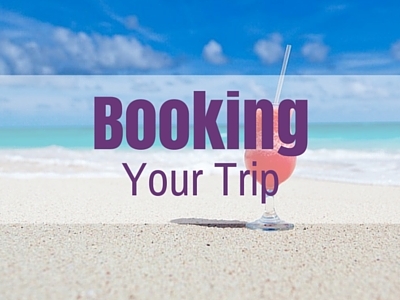 I plan on doing a heap of travel outside of London…. And I cannot wait. Thanks that was really helpful! !